← Lunch Break WIPs: and an FO! Too excited to wait until I’d blocked it, so it’s a little messy. I knew when I made that schedule how silly it was! I always think, “Gee, if I only had a schedule, things would turn out great.” Never happens. I make the schedule and ignore it completely. I do the same with recipes. They’re more guidelines than actual rules. Which is how the hat above got finished this week! 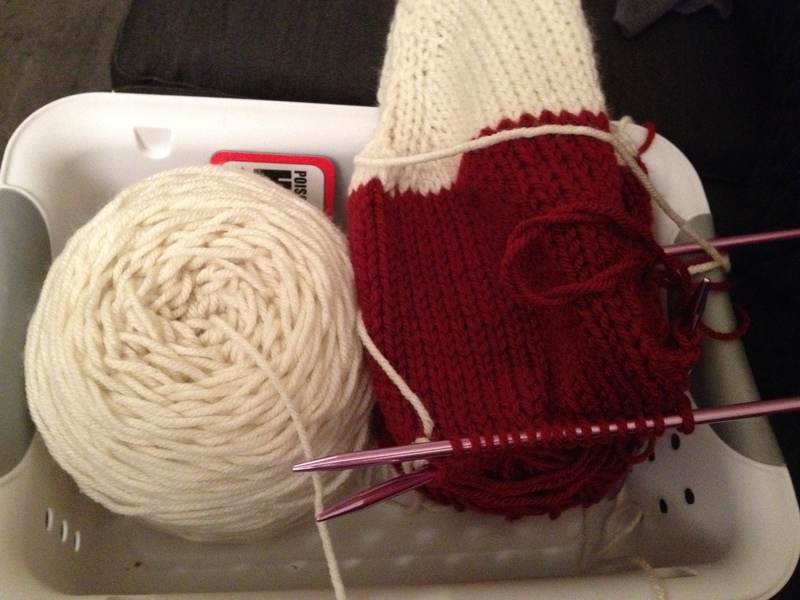 On Wednesday I was faced with a decision: Stick to the schedule and work on the stocking or finish the hat. I opted for the hat, knowing I really would be done the next evening. Sure enough, by around 9:30 pm I had finished weaving in all the ends. I still need to block it, so it’s not finished finished, but the hard part is over. 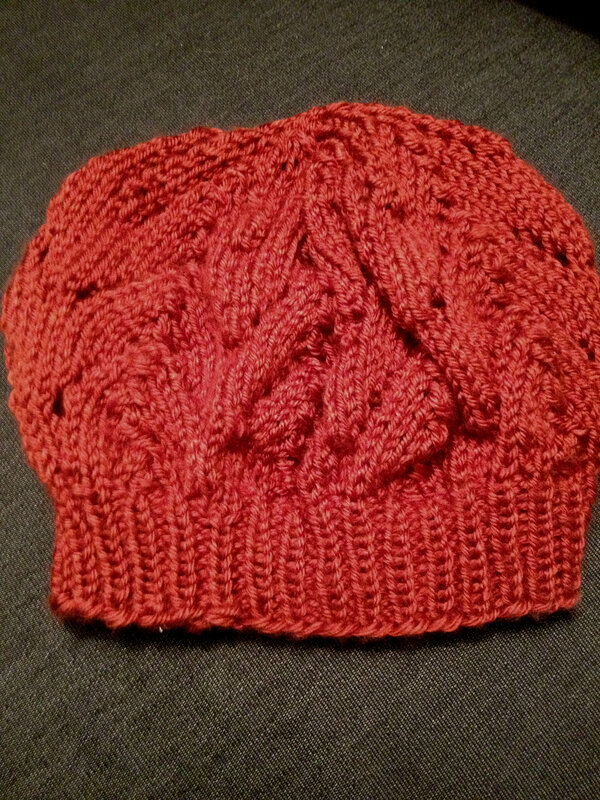 The pattern is Meret (Mystery Beret) by Woolly Wormhead. I believe that the yarn is a Red Heart Soft by the feel of it, but I do know for sure it’s acrylic (like most of my stash, sadly). This was my second time around with the Meret, and I was much more successful. For one thing, I knit a swatch. Gasp! Yes, I said it! I, Ana, actually knit a swatch. After I knew I had the right needles, I opted for the smallest size rather than the largest, which was what I chose last time. Much better. It fits like a dream now, so I’m very happy with it. That’s one Christmas present off my list! And, I like the pattern so much and love that it’s so fast to knit that I’m thinking of using this as my go-to present pattern for any other hats I may need. It’ll also help bust some of my acrylic stash. I did manage to get a little work done on my Christmas stockings list as well, even after skipping Wednesday. The toe is huge, probably bigger than I’ll want for the rest of the stockings, but this is a trial run (more likely will become Rizzle’s stocking). I think the stocking is turning out huge, but when mom saw it last night, she thought it looked okay. Maybe it’s just the socks I’ve been working on lately that make it seem so big. I did opt for the afterthought heel. I’m hoping that it’ll help give me the shaping I want. With all the Christmas on this blog, it’s hard to believe it’s just turned October! Are you working on any Christmas projects? You’re dedicated! I decided not to do any Christmas projects this year because when I make gifts, they always take longer and cost more than I would like. I’m going to be baking my Christmas gifts this year, like holiday breads or something. Cheap, quick, and delicious! That sounds like fun, too!